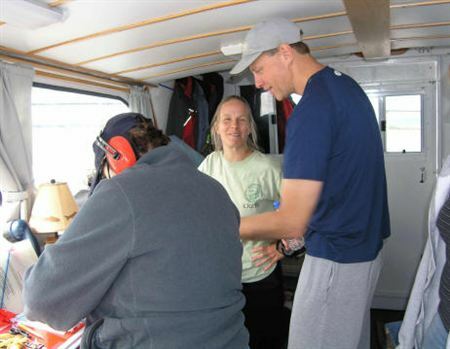 This summer, the GLSPS received a grant award from the Minnesota Lake Superior Coastal Program. This grant divided the cost of the documentation of both the Mayflower and the Wallace with the GLSPS. This year, Lake Superior showed us how tough things can get on the lake! 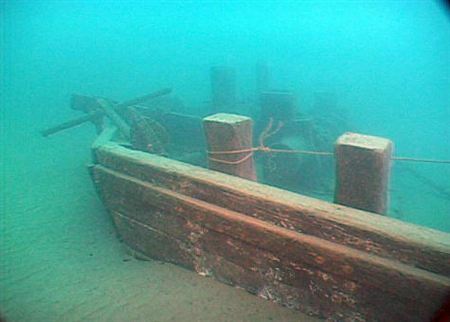 On both of the original scheduled trips, we were not able to dive on the Mayflower due to weather and waves. In July, Steve Daniel captained the Preservation with Co-Captain Ken Knutsen to the Mayflower. Documenters included: Pat Olson, Linda Negus Jim Christenson, Tim Pranke, Bill Wallace, Pete McConnell, Helen Wright and Emma Wallace. When we arrived at the Mayflower the waves were 1 to 3’ and growing. For safety, the dive was canceled and we returned to the marina. On Sunday, Helen reported white caps out on the lake and stronger winds. Sunday’s trip was then canceled. We scheduled another trip out in September, and this time we had perfect weather. To speed up the process of finding the buoy, Tim P. and Pete M met Corey Daniel at the boat launch and left in a 17’ Zodiac to get the line and have it ready for the Preservation. It took a little longer then planned, but we were able to find it. 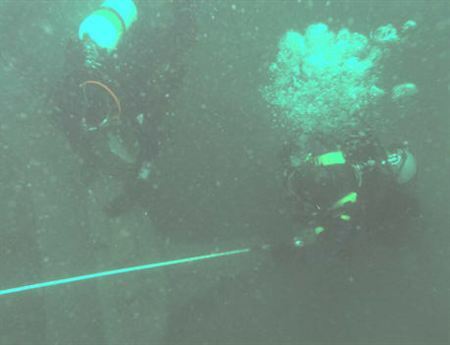 The first Team of divers, including: Byron Meyer, Corey D. and Pete M went down to place the Bass Line used to measure the location of artifacts on the wreck. Byron held the line at the Bow and Corey swam to the Stern. 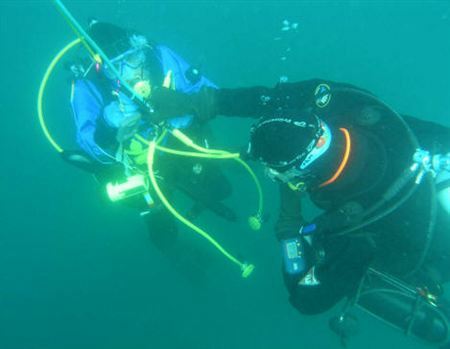 When the line was in place and verified that it did not go around objects and/or over taller objects, Pete M signaled the other divers to secure it. Steve D. photographed the placing of the baseline. The next team, Tim Pranke and Phil Kerber entered the water and measured the position and size of the Starboard anchor. Thanks to all who made it out on the documentation dives/boat ride this summer. I hope to see everyone out again next year on one or more of our future documentation trips. 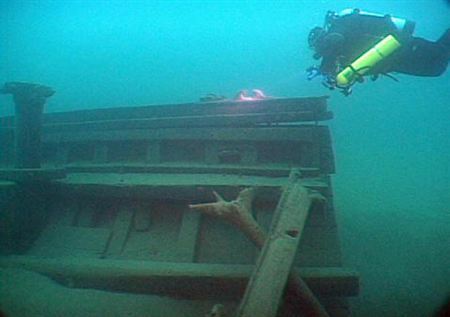 Next year we have more dives scheduled to document the Mayflower. We welcome all members with advanced certification to sign up and join us in documenting the shipwreck. Documentation gives a great incite into the construction of a ship. 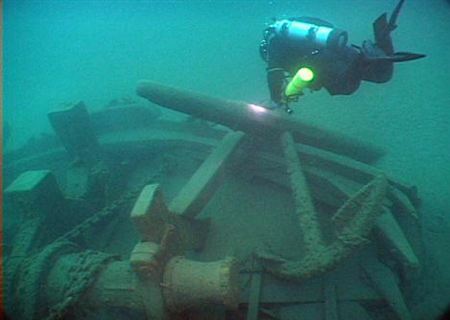 When diving a shipwreck, you may not pay close attention to some of the more detailed sections. 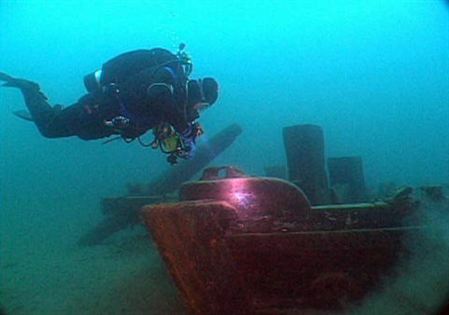 When you document the wreck, you notice more details of the wreck and how it was constructed. Corey and Pete on safety stop. Emma, Pat, and Pete work on Mayflower drawing. 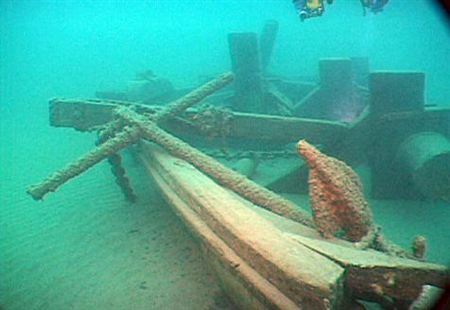 A 2006 photo of the bow area and the wood stock starboard anchor. 2006 photo of the Mayflower Anchor windlass. 2006 photo of the port iron stock anchor. 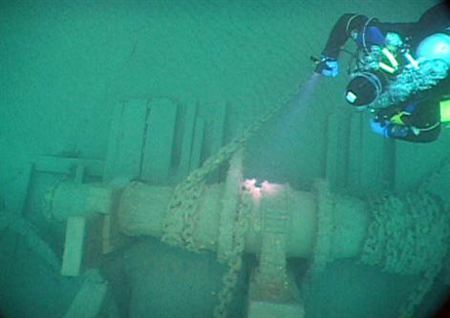 2006 photo of the port side mooring bits; note how the ship is buried into the bottom. 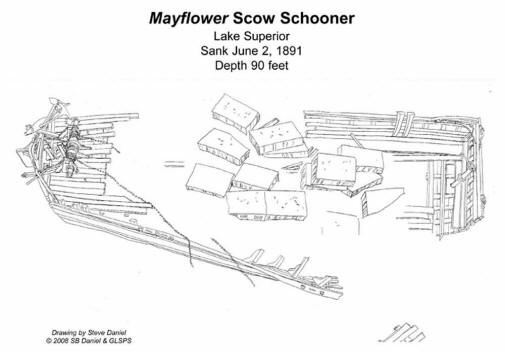 Scow schooners were sailing barges with blunt bows. 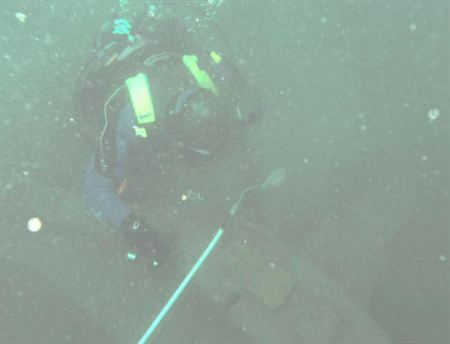 2006 photo of the Mayflower port inside corner of the stern.